“Memory is a defining characteristic of New England-this great desire to mark the landscape with historical monuments, to crowd little museums full of small acts of homage, and to tell certain stories,” writes Mansfield. Mansfield visited many small museums and local historical societies which he calls “memory houses.” He examined the changes in Town Meeting and the changes in our local landscape: the loss of the elms, and the bulldozing of an entire neighborhood, Boston’s West End. He explored the histories of Franklin Pierce, Thoreau, Johnny Appleseed and Jack Kerouac. "Mr. Mansfield gets beneath the patina of the tangible and intangible relics of our history to locate the emotional core of our past. 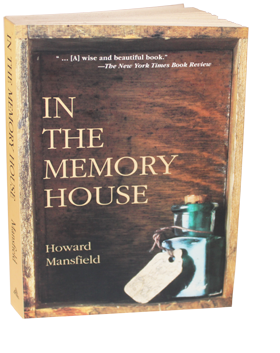 Through the intensity of his language, his pace and wit, the predisposed reader can take the leap into collective memory and even catch, with Mr. Mansfield, that damp, sweet scent of the past. [a] wise and beautiful book."